A few years ago I realized that many of the poets and writers whose work I love are also educators in one fashion or another. After this realization, and with the help of an English Composition and Rhetoric professor, I decided to pursue a teaching certificate. I still don’t have it, but even as I completed my degree in English in 2011, I knew it was what I wanted. I took a year off of school and I worked for the Metro Library System. I needed time to decide on a master’s program. I loved working for the library, not just because I’m a nerd and I love to be surrounded by books, but because the public library system for Oklahoma County does a lot of good community work. It’s their mission to make books, magazines, computers, newspapers, and countless other resources accessible to all OK County residents for free or as close to free as possible. People who don’t have home computers come in to use those belonging to the library. People without jobs come in to find books about resumes and about their craft, to find ACT, GRE, and CDL test books, to talk to computer specialists about how to use Microsoft Word or Powerpoint. They have music, history, literacy, and community programs. I honestly believe that if you live in Oklahoma County and need to enhance your life, the public library is where you start. One day, while working, I noticed a flyer from the Oklahoma City Metro Literacy Coalition (OKCMLC). I didn’t know who they were, but I knew I cared about literacy. Their flyer advertised a part-time job as coordinator for their new Referrals Enhancing Advancement in Literacy (REAL) program. I figured it wouldn’t hurt to call and ask, so I did. 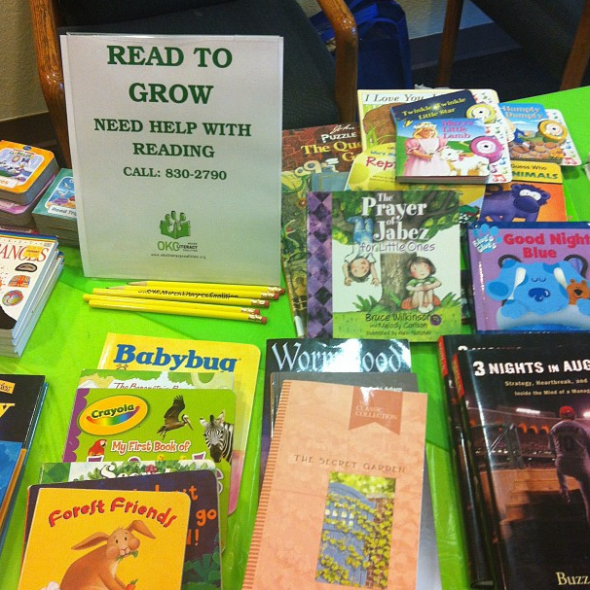 A few weeks later, I was hired onto the volunteer board-run literacy support organization. My position was based on an Oklahoma City Community Foundation grant. The job, in a nutshell, is to connect people to the literacy resources they need. So if you’re an adult who would like to improve your reading comprehension and fluency, or if English is your second language, if there are children that need resources to improve their reading or if the community has additional needs that other organizations can meet, then it’s my job to help everyone as efficiently as possible. In doing this job, I’ve found it has created another desire: I need to feel like a significant part of the solution. OKCMLC is a support organization making great strides every day to help people get the resources they need. The unfortunate fact is that there are usually not enough resources to meet all of the needs. I get slightly frustrated when I have to say to a client, “I don’t know what to tell you.” I want to be one of the people who has the answers. While managing my database and taking referral calls, I realized how unfortunate it is that there are not very many resources for children outside the classroom. But as with most things in life, if you can’t afford the service, you can’t get the answer. No disrespect to their profession, as everyone is entitled to make a living, but my next thought was: “Does anyone do this job at no cost to the student’s family?” Then I realized I had the knowledge and ability to answer that question. I could apply for grants to essentially subsidized the reading education of the those in the lowest income brackets. These are the people who can’t afford much outside their basic needs, but want to make a difference in their lives and that of their children. In a way, I’d almost be a freelance teacher. I researched the master’s degree for reading development and the pertinent coursework. It is an add-on to a teaching certificate, more than a certificate on its own. This aligned with my desire to be a part of the solution, so I quickly enrolled at UCO, found and applied for the TEACH grant and got started. I am back in school, in the education department studying in the field I never really wanted to leave. It’s good to feel like I’m making strides to not only help my community, but also provide a life for myself that I am happy to live. I entered the master’s program because I have seen over the last year that the first indicator of state literacy, the target range for OKCMLC, is the reading test scores of the state’s third-graders. This testing is by no means the only benchmark they need to pass, but it is the first. And as is the case with all processes, a major benchmark cannot be met if minor benchmarks go unmet. After cross-referencing my research with the State Department of Education’s website, as well as keeping current with Oklahoma educational news, I know that Oklahoma high-school reading test scores and graduation rates leave much to be desired, especially if you look at certain demographics. Until recently I did not know the specific trajectory from third-grade success to high-school success. In December, the chairwoman of the OKCMLC board, Betsy Mantor, saw a citywide opportunity for the Campaign for Grade Level Reading. Mantor observed that Oklahoma City would be a great candidate for partnership with the nationwide network. OKCMLC began to have meetings hosted by Smart Start Central Oklahoma at the United Way of Central Oklahoma. These meetings welcomed teachers, educational administrators, community organizers, literacy service providers, the Metro Library System and essentially anyone else interested in improving literacy development in the community. We met approximately once a month until April when we submitted an action plan to the Campaign (in partnership with the National Civic League’s All-America City Award ). We spent many hours emailing, creating documents, brainstorming and drafting. Then six of us – myself and a member of OKCMLC’s board included – went to the Communities Network Meeting for the Campaign in Denver, CO the first week in July. Since then we, Read to Be OKC, have been doing what we can to put ideas into action, which is much harder than you might think. Read to Be OKC, as a direct partner with the national Campaign for Grade-Level Reading, is focused on the most important predictor of school success and high school graduation. Where again, it all comes back to grade-level reading by the end of third grade. The campaign has identified three focus areas that have real potential to drive improvements in grade-level reading. First there is school readiness. Too many young children arrive at school developmentally behind. Second is school attendance. Too many children in grades K-3 miss too many days of school. And third, there is Summer learning. Too many children in the early grades lose ground over the summer months, particularly among students from low-income families. Are you starting to see a pattern here? My classroom studies have been backed up the research that says, proficiency in reading by the third grade enables students to shift from learning to read to reading to learn. This step is absolutely critical for the mastery of more complex subject matter. We must combine effective teaching for all children in every classroom everyday with proven strategies to support school readiness, school attendance and summer learning. Schools cannot be expected to do this alone and they need local coalitions to mobilize the expertise and manpower of the community to support this work. This grass roots involvement from the community helps to remove barriers, expands opportunities, and assists parents in helping their children succeed. Isn’t that the American dream we all believe in? So how does the government fall into this matrix? First, they decide how schools are funded, and have previously decided that the method would be through property tax. This, in effect, means that areas with higher-priced real estate have better funded schools. I was unaware of this until midway through my undergrad and have been angry about it ever since. It doesn’t seem fair in the least. Where is the equality in public education? Secondly, the legislature makes all kinds of decisions about the allocation of other funds to schools. The Oklahoma State Department of Education decides whether to fund various school programs, like Smart Start in the Schools, and which standards teachers must adhere to in their classrooms, for example the recent change from the PASS skills to the PARCC skills or “Common Core.” The state department also decides how many and which tests students will have to take to determine their proficiency levels. Take for instance, the newer test high-school seniors have to take at the end of year. The state legislature writes education bills like the Reading Sufficiency Act. Essentially the act says those students who do not pass their standardized tests in third grade will not be socially promoted to fourth grade, but retained with the goal of getting a passing score the next semester or year. There are exceptions to who will be retained, the specifics of which were outlined in the bill’s revision stage. Something to consider, the language of the clause reads “retained students shall be provided other strategies.” Let that sink in for a second. Now the bill includes a list of potential resources and remediation, but none of the proposed “other strategies” are free or already in place, and the bill does not provide a funding source. In effect, the legislature has told the state, not just teachers or parents, that something must drastically change or there will be a large number of upset third-graders and family members in 2014. In my humble opinion, prepared teachers, properly trained and affordable tutors, and organizations like Read to Be OKC are the frontline resources for Oklahoma’s dilemma. We all want kids to read at grade-level. Period. The reasons why children, specifically low-income children, which many statistics indicate are predominantly African-American, Latino, and Native American, are not doing well are varied and complex. A “one size fits all solution” cannot be expected to help everyone equally. Realistically, the solutions to the problems will be varied and complex. It is not all pedagogical, in that teachers need to do better and it is not all political, in that the government needs to give more money and support to education. It is not all familial, where the parents need to read, talk, sing, play and hold their young children more (the mantra of Smart Start). If it is no single group’s fault, then no single group can be held exclusively accountable for fixing it. So on behalf of myself – a writer, a person of color, a resident in the Oklahoma City Public School district – and on behalf of the collaborative Read to Be OKC, I want to ask my community to be a part of the solution. I know my part is reading specialist, teacher, and advocate. Do you know what your part is? Since I’m calling on everyone to participate, I would be remiss to not provide suggestions. If you can read more, do so. This is called modeling. If you can teach or tutor, do so, volunteer. This is direct assistance and intervention. If you can give a ride home after tutoring, do so. This is support. If you can read legislation and write to your Congress people, do so. This is activism. If you can tweet and retweet, or share on Facebook, or Blogger or Tumblr, do so. This is the functional branch of social media. Make education a trending topic rather than Rihanna and Chris Brown. And there’s one very, very simple thing we all can do: never be dismissive of people who read because they love to, even if you are not one of these people. This is also modeling. When a kid hears you talking about how you don’t like to read, or how it’s boring, that does not motivate him to pick up a book. And we need to rethink the way encourage reading outside of books too. Below is a video that talks about how changing times demand changing strategies. Ask yourself how we as a community can improve our standard of living and then get involved. Tagged books, community, cs, language, Metro Library System, OKCMLC, Oklahoma County, PARCC, PASS, reading, research, UCO. Bookmark the permalink.